If you are travelling with AirAsia to or from Coolangatta Airport (OOL, Gold Coast) we have services to suit! Find out more about our AirAsia Shuttle Bus Service to the Gold Coast Airport here. We think of our customers as friends we haven't met yet, and as a family owned and operated business when you travel with us you'll become part of our Link Transfers family! Don't worry about carrying heavy bags onto public transport or expensive short or long term parking for your car — Link Transfers will take care of everything for you! When you are on our shuttle bus you can relax knowing that we love what we do, and that we will get you to your destination on time every time. As the official AirAsia Coolangatta airport shuttle bus, our timetable is perfectly suited to AirAsia flights but passengers from other airlines are more than welcome to join us too. Choose us for an easy and cheap Gold Coast Airport bus that you can rely on. We’ll pick you up from your hotels in Brisbane and the Gold Coast as well to make for a convenient transfer. We offer door to door shuttle buses and private transfers to and from your Brisbane or Gold Coast home, hotel, Gold Coast Coolangatta and Brisbane Airport, and even the Brisbane Cruise Terminal. We provide extremely affordable rates on our shuttle service, from $39/person (one way) for Brisbane to Gold Coast Airport Transfers, We also offer best fares for private transfers to suit your specific requirements. At Link Transfers we offer the easiest and friendliest service at the cheapest price possible! It's easy! You can book our Gold Coast airport shuttles or private transfer through our convenient online booking service! Once you have made your booking online, you will receive printable tickets and an itinerary. Access to the Gold Coast Airport has never been easier! 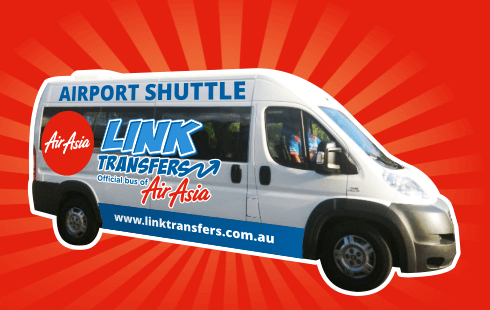 Link Transfers are the official bus of AirAsia at the Gold Coast Airport. So if you’re flying with AirAsia to or from the Gold Coast Airport use Link Transfers AirAsia shuttle bus for an easy and stress-free experience. Our timetable is perfectly suited to most AirAsia flights so you will always arrive at Gold Coast Airport check-in with plenty of time to spare! How much luggage can I take on the airport shuttle? We allow 1 carry on and 1 checkin bag per person as our standard limit, extra check in bags just $6 per bag (2 carry on bag = 1 check in bag). Do you offer a discounted rate if I book a return trip? We don’t offer a return discount, we just offer the cheapest price for every transfer. Book online and you’ll receive reduced rates too. To book a return trip choose your one-way journey first, complete all details and then “add another transfer” before proceeding to checkout.